You can choose which types of email notifications you receive, or unsubscribe from all of them on your 'Notification settings' page. Learn what emails you receive from Storypark by default and see how you can have more control over what you receive. 2. 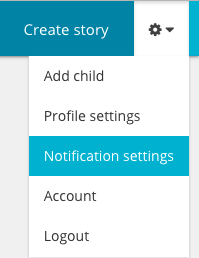 From the dropdown menu select ‘Notification settings’. 3. You’ll be taken to a form where you'll see a series of checkboxes. If you do not wish to receive any emails from Storypark, you can check the 'Unsubscribe from all email notifications' option at the bottom of the page and tap 'Save my preferences'.